You'll be sitting pretty in this Zeta office chair. This chair has a definitive contemporary look, with its espresso finish and clean, crisp lines. Black faux leather upholstery gives the chair a sleek appearance while retaining the look of leather without the maintenance requirements. The frame is made from hardwood solids with veneers, so it's stout and sturdy enough to hold up to heavy everyday use. Thickly padded seat, back, and arm cushions add to the chair's comfort factor, while casters on the five-star base let you quickly move from one spot in your office to the next without getting up. 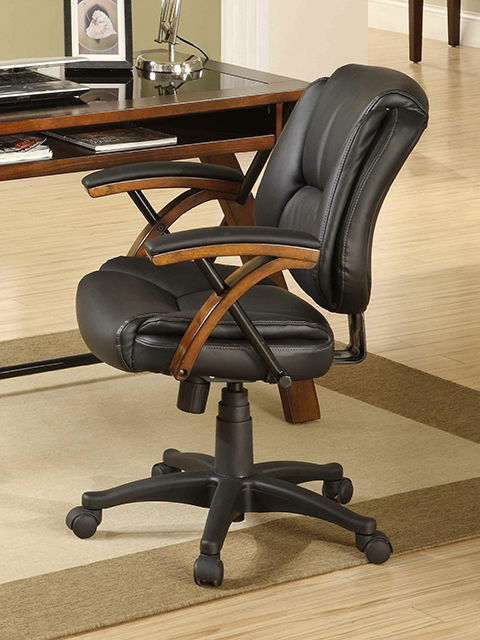 Kick back and get comfortable while you work in this Zeta office chair.